Early in the morning, as the light of the sun rising in the east fully lit the colorful glass in the windows, Ruqqayah crossed the courtyard from her chamber and entered the main hall. 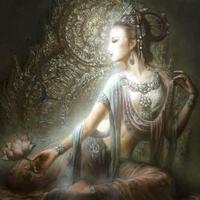 Finding a place to lay out her mat, she knelt down and prayed to the goddess. I've found very little this last week... I can't find what I need just hiding here. Please, grant me to the wisdom to find what I need. Grant me the knowledge to help with my brother's return... It was all internal, a goal she'd told no one yet, outside of these silent pleas. After, she went through the more standard sorts of prayers, thanking her for her role in her people's history and the compassion and strength she still lent them. Mahasin soon joined the room to conduct prayers for the faithful, having descended from her minaret. Once they were over, she approached the young cousin. "Lella, I wish to speak with you, in private." When Mahasin gets her attention, she rises and nods. "Of course. Lead the way." When they were alone in a room fantastically doused in colours of prismatically dispersed sunrays painting the floors, Mahasin turned to Ruqqayah with a concerned expression. "Lella Ruqqayah, I have it on good account that Sheikh al-Hattar has been given the mission by the Grand Vizier to find you, certainly at your enlightened father's behest. I have sheltered you on benefit of a doubt but now that the Grand Mufti wants a sign of your life I cannot condone it. I cannot command your fate for I believe your quest is fueled by the power of the Wind to the West which drives the Hajj. But I will not lie to Shiekh al-Hattar when he comes asking. Do what you must, Shinjo's will be done." She took a slow breath in and out. She knew it was coming sooner or later. "Do what you need to do. It's all right. I'm sorry for putting you in this position by staying so long," she replied, dipping her head apologetically. "It's all right, daughter. I am grateful to our Goddess that she let me keep you here for a time. Your studiousness reminded me how I was not so long ago and what I forsook somewhere in the middle, becoming more settled than I would like, like my hajj to this island was enough while deep in my heart I know it is not." She sighed with a gentle smile. "Sure you'll be fine? In a sense you must be, or your misfortune will be on me." "I'll make sure of it for your sake, at the very least. Anyway, I have a promise to fulfill, so I have to be fine at least until then," she assures with a smile. "Do you plan on moving on, then, someday?" "Inshinjauh, however Shinjo wills it." Mahasin smiled gently. "Don't be too hard on yourself. You have Her Compassion, don't deny it to yourself." "If the time comes, it will be evident," she agrees with a smile in return. Her eyes lowered for a moment. "I will do my best. But... it's hard to deny that it should have been... It shouldn't have been him in that accident." "All is as Shinjo wills it, my child. Maybe his sacrifice has been necessary for greater works of this world to be given their turn. You wouldn't have been here, where tethers of the old are pulled on every side, more and more revealing the new. Future belongs to Her. Never doubt, my child." She bowed her head, as if in short prayer, before nodding, seeming to have a little more energy. "You're completely right, of course. I will trust Her future." She looks around. "I should probably pack and be out of your hair as soon as possible, anyway." "I don't ask for the names of all those who come to pray. We're still umma." It was Mahasin's way to tell her to return to the mosque when she needed. She bowed her head in acknowledgment and smiled. "I understand. As-salaam alaikum, cousin." With a bow, she stepped back and took her leave, heading to gather her possessions and vacate.